Maryville Monument Company was founded in the early 1920’s. Then located on West Main Street next to Saint Andrews Episcopal Church (now Broadway Avenue) the company was named Maryville Marble Company. The marble industry in Blount County was in full swing with at least five quarries located near Friendsville and Louisville. As logistics improved, granite was also introduced to the Blount County monument business and the name was changed to Maryville Granite and Marble Works. In 1943, the Staley family purchased Maryville Monumental Works and it was moved to its present location at 804 East Broadway Avenue. The current owner, Jeff Wallace, purchased Maryville Monument Company in 2008. With over 30 years of experience in construction, the industry came natural to him; however, he called upon partner, Donnie Poteet of McCammon-Ammons-Click Funeral Home, to broaden his knowledge in the memorial business. Jeff then became sole owner in 2013. Over the years the owners and names have changed various times; however, many things have remained the same. The office team has continued the established filing system and can pull sales contracts dating back to the mid-forties. The shop team has continued the quality craftsmanship on both granite and marble monuments, all of which are sandblasted on-site with precise detail. Over ninety years later, we still take pride in each memorial as a lasting tribute to your loved one. While Jeff has only owner Maryville Monument Company for 10 years, he has over 30 years of experience in the construction industry. In his spare time, Jeff is a dog lover who enjoys working with rescues. He currently has 2 pit bulls along with a long haired dachshund. Jeff enjoys coaching youth football and volunteering with Little League. Growing up in Maryville and the daughter of a small business owner, Tabitha enjoys working with a company so rich in local history. Her experience is in both bookkeeping and human resources. Tabitha’s weekends are usually filled with her two daughters, four dogs, a cat, coaching softball, and cheering on the Vols. 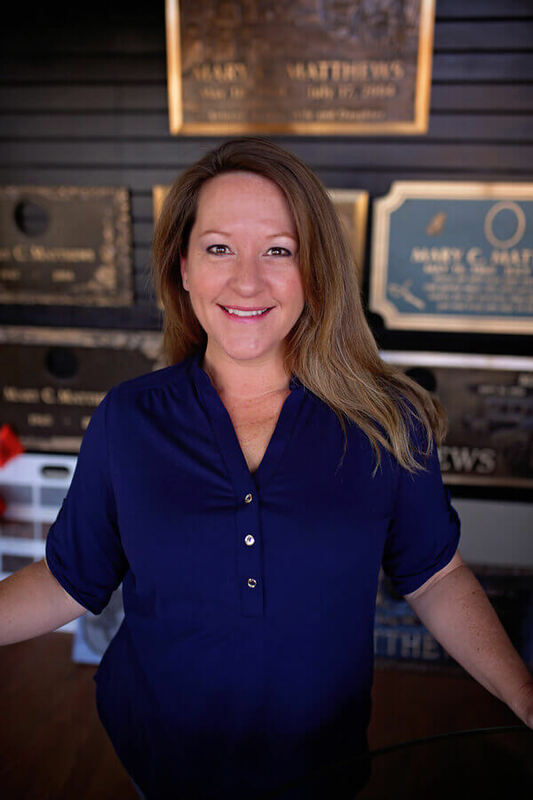 With over 6 years in the memorial industry, Rebecca has vast knowledge and passion for helping families create a lasting tribute to their loved ones. Outside of spending time with her son and three fur babies, she enjoys snow skiing and traveling. With over 20 years of experience in customer service and logistics, Christy has a true appreciation in delivering a great experience to our families. Christy is originally from Mississippi but has lived in Maryville for 6 years now. She enjoys spending time with her daughter, working out, and reading. Drew is a Blount County native currently pursuing his degree in Construction Business. When not working at Island Home Monument or studying, Drew enjoys kayaking and fishing. Canaan joins us from Elberton, Georgia, also known as the Granite Capital of the World. His families granite work goes back multiple generations with Canaan first learning the craftsmanship in his Pa’s granite shed. Canaan moved his high school sweet heart and two sons to Maryville in the summer of 2018. In his spare time, Canaan enjoys hunting and fishing. Alysia first earned her experience in monument etching through a college internship while attending The Art Institute of Pittsburg. After many years of traveling and exploring her love of art, the mountains were calling her to Tennessee. She set roots near family after evacuating from Hurricane Irma in 2017. While Alyssa still enjoys painting, pencil drawings, and teaching paint parties, helping families create custom etchings, especially portraits, of their loved ones is dear to her heart. She hopes each piece of art brings some peace and comfort to her clients.